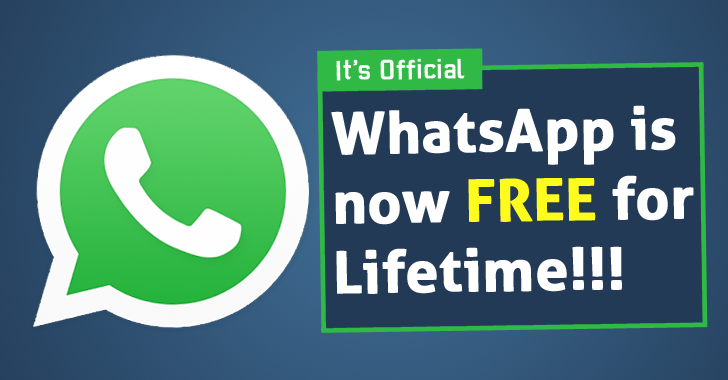 Good News for WhatsApp users! The widely popular messaging service is going completely free. And you’ll be able to use WhatsApp without paying a penny. Old WhatsApp users might not be aware of this, but WhatsApp introduced the subscription fees for its service a few years ago, forcing new users to pay an annual 99 cents (~$1) subscription fee after the first year. However, WhatsApp announced Monday that the Facebook-owned company is dropping its annual subscription fee to make its service free to all users. While announcing the plan today, WhatsApp’s founder Jan Koum stated that the annual subscription fee was still a barrier to some users. What will be WhatsApp’s New Business Model? WhatsApp categorically said the company won’t be replacing the subscription fee with third-party advertisements like intrusive banner and interstitials, which nowadays is a common practice used to make free applications profitable. Instead, the company said it will explore ways businesses can use WhatsApp to connect with individuals, and will introduce new ways for users to communicate with businesses and organisations that will pay the company to target relevant communications with customers. A bank could use WhatsApp paid account to communicate with its customers about recent transactions and necessary fraud warnings. An airline could use WhatsApp paid account to contact its passengers about a delayed schedule or cancelled flight. It is the same approach WhatsApp parent company Facebook is using with its own Messenger application, which in last month started allowing its users to book an Uber cab directly through the Messenger app.